TNT Express is one of the world’s largest express delivery companies and since May 2016, part of FedEx. On a daily basis, TNT Express delivers close to one million consignments ranging from documents and parcels to palletised freight. The company offers road and air delivery services in Europe, the Middle East and Africa, Asia-Pacific and the Americas. TNT had problems with injuries due to manual lifting with the associated sick leave and rehabilitation costs. As part of a worldwide Health & Safety Program, the challenge was to find a lifting aid that maintained or increased speed and productivity while lifting. The lifting aid should be able to handle at least 75% of the parcels. The solution also had to be user-friendly and adaptable to both left and right-handed persons. Several Vaculex® TP were installed, at TNT Express, to increase the speed and productivity. After installing several Vaculex® TP at TNT, injuries were reduced to a minimum. The vacuum tube lifts maintained or increased speed and productivity as parcels became weightless and easier to handle, no matter what size or shape. 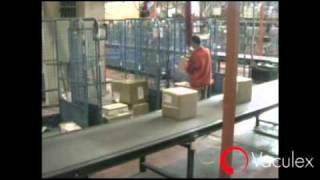 Vaculex® TP proved to handle 99% of the parcels with ease.